Club Penguin Cheats by Mimo777 Club Penguin Cheats by Mimo777: Club Penguin Series 7 Treasure Book Cheats! On page one, click on the pot of gold. You get the Chocolate Bunny Costume! Go to page 2 and click on the lights. Get the Secret Agent outfit! Go to page 4 and click on the black spot under the Faery costume. You get a Bumble Bee costume! Hmmm.. i bet the page 8 is a secret page like the old treasure book was!! or maybee they are trying to put the orange puffle into it!! Mimo, like I said, I will TRY to mod today! Hey mimo!if you cheak out the beacon and the lodge there are 2 pins up!!!! Guess what page 8 is. I got a toy and it is so unnecessary. It's the exact same super exclusives in series 6. The super exclusives are exactly the same as series seven. Pinkrosie909, it can't be the orange puffle. It's already on the page with the regular puffles. It will probably be a secret page, though. Mimo i dont get it. Do you actually get the outfits and costumes to wear? Or do you just look at them? The secret page is for people who have at least ten clupbenguin toys. they get super exclusive items! They are pretty c ool it is like for series 6. Hi there! The treasure books are actually online(if thats what you meant).You get a toy that has a code ond go on Club Penguin to unlock it! You get to choose some items!Club Penguin also has an unlockable tutorial. So check that out! Your penguin wears them, I believe. I think Pinkrosie909 means as items for the orange puffle, not the actual orange puffle. If this it what you menat, the treausre books are online! You get a toy with a code and unlock items!Club Penguin has an unlockable turtorial so if its your first time with a code, you might want to check that out! You get them to wear them! They are clothes, or puffles,or coins! 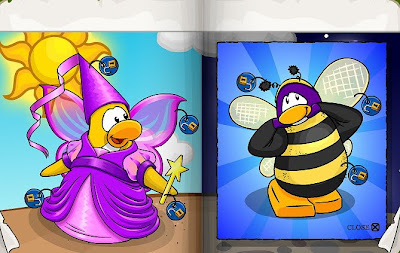 So the clothes are like in the Catlog, you can wear them!And the puffles are regular puffles! So were do u find it? hi i got a blog to about club penguin to i also like your blog. They're just bringing back some old stuff. Its cool though. Ugh, sorry I wasn't on at all yesterday! I have this really big project in science, so don't expect me much 'til at least the end of the week! NO they are not in the book room. YOu have to buy a plush puffle to get the trasure book. u enter the c ode and u get it. PLush penguins will only unlock the series they go with and there arent any series 7 penguins yet. Puffles unlock the latest series. If u have like 5 or more codes already entered u get the super secret page and two bonus items! I hope that helped. toys are available at toys r us and disney store. toys r us is cheaper thandisney store but worse items but disney has about 2 dollars more for cooler items! Well, the orange puffle is already in the puffle section in the catalog, so it can't be in the secret exclusive section. Check it out! I am not going anywhere! I ma here to stay.. Mimo.. I am computer grounded for a month.. so I may not be able to mod.. I hope you understand! Thanks! Do you mean the Club Penguin place, where they show you different books? No, if you are at the toys section, scroll down and click "View the Treasure Book". It should pop up! Yup! Mimo already posted this, but thanks for telling the people who may not already know! Keep making great observations! Ok, go to the toys page of the CP site. Then scroll down 'til you see an icon that says "View the Treasure Book". Click it, and it should come up! But if you buy a toys, you can be able to unlock two items! If you have a coin code from a CP toy, you unlock it. You can also view it by going to the toys page of CP and clicking "View the Treasure Book"! Yeah, the old stuff is cool. I like the exclusives, I love the new Black MP3000, don't you?! I think there's a code you unlock it with.. I think it's unlocked with a code. Cool! Mimo already mentioned this though! The feather one will be there til March 19th when the play is gone. I have an older penguin plush. Can I get the orange puffle with it? BTW, it's the pajama penguin. Cool! Which one did you get? Hmm... that IS weird. Did you try clearing your cache? If that doesn't work, try contacting CP. Yes, I think the old items are the best. I like the referee costume. Which is your fave? Well that stinks. I think Mimo will understand. You go to the toys page and click "View Treasure Book". Just go to the toys section of CP and select "View Treasure Book". 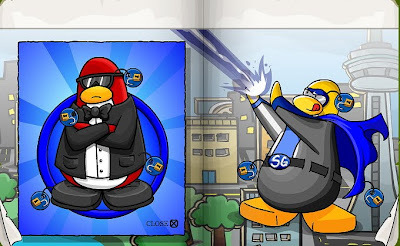 Hmmm, Club Penguin has an unlockable turtorial, check that out! Plus, Mimo cant add you beacuse it would be unfair. He only adds high ranked mods, family,and personal friends. That dosent mean you cant meeet him at one of his partys! 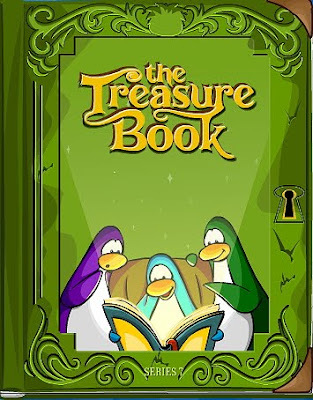 Ok, I've said this three times but, you go to the toys section of CP and hit "View the Treasure Book". You can find the treasure books under the "toys" page. It's actually on the home page and is more or less an e-book. You buy the toys and enter the coin code and then you can get stuff for the game. If you go to the home page and click the toys page you will see another tab for the treasure book. It's on the toys page and you click the "view the treasure book" tab. If you mean the book room, then it will not be there. The treasure book can be seen from going to the toys part on their main site. Cool! Iosis. XD! Anyways, my score in Truck Launch Maniac (one jump) is 1923... with the octagon wheels. It is addicting! Umm what is a treasure book and how do u use it? can non members do it too? I will mod a little now! I'M BACK!! Hi Anonymous! You find the treasure books by going into the toys section and clicking on treasure book! Hi Anonymous! 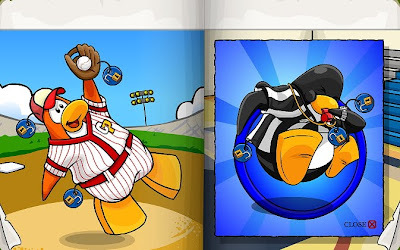 Yes, you do get the outfits if you buy a clubpenguin toy! It comes with a coin code that will let you use the Treasure Book! Hi Wooster65! Sorry, but Mimo already posted this! Mimo, that's my morning modding! Bye!! Go to Toys and click View Treasure book! When you use a code for something which isn't Card Jitsu or a book, then you get to choose a thing from the book. And I wish that you could get furniture items from the books! Just go to the toys section of CP and click "View Treasure Book". Where is the The Treasure Book Series 7? And what is The Treasure Book Series 7? is thier anyway to buy stuff in the tresure books? hi mimo777 is thier anyway to buy the stuff in the treasure book???? The treasure book is a special book. It contains Club Penguin items. 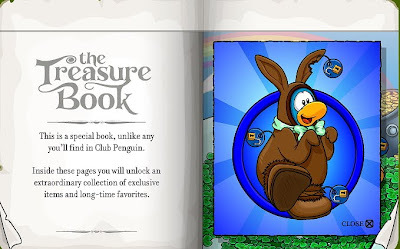 You CAN get the items in the treasure book, but you need to buy a Club Penguin toy. Then, once you have a toy, go to play.clubpenguin.com (click on the link to go there) and click on the "Unlock Items Online" button. Then, log in, and click on "I have a toy". On your toy, you should find a code which you enter onto your computer. Then, the treasure book will come up, and you can choose to unlock a certain amount of items from the treasure book. Then, click on "done" and you will get to wear the items you unlocked!! They will always be there, whether you have membership or not. Hmmm, not that I know of. I do however know that some of the stuff in some other treausre books, has been availble for you to buy before. So, who knows! Good answer! Im sure that helped alot of people! And you dont need to put "CPG Mod in training" if you are actually modding! Just put "CPG Mod" after your name. But, remeber, dont put it after your name if you arent modding! Hello... what is in the super secret exclusives page???? how do you get to the book?